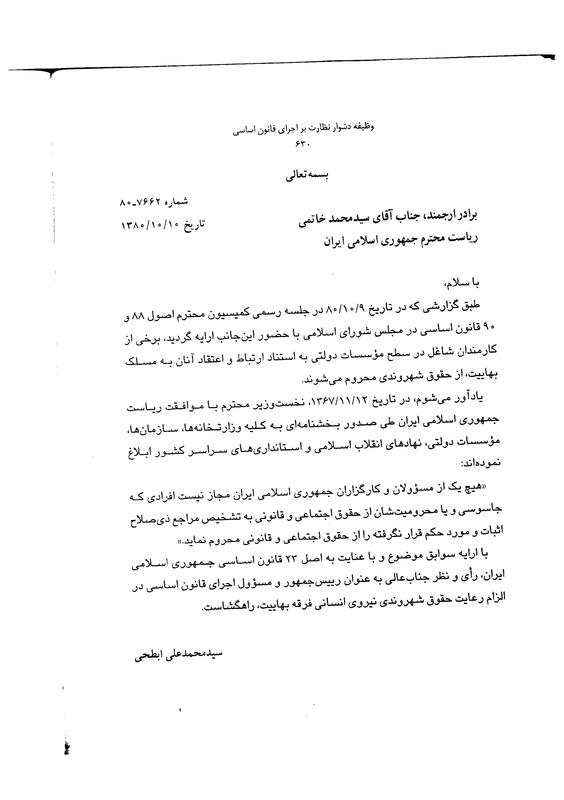 This document indicates that, in response to a question asked by the Legal and Parliamentary Office of the President about problems associated with the rights of Iranian Bahá’ís as citizens of Iran, Mohammad Khatami, the Iranian President at the time, approves Mir-Hossein Mousavi’s decree, issued in 1367 (1988), and finds it inappropriate to prolong the problem. To be reviewed and resolved. I had previously responded to a similar issue. In any case I think it is quite unjustifiable to re-evaluate a case that had been considered resolved in the year 67 (89) as a new problem today. 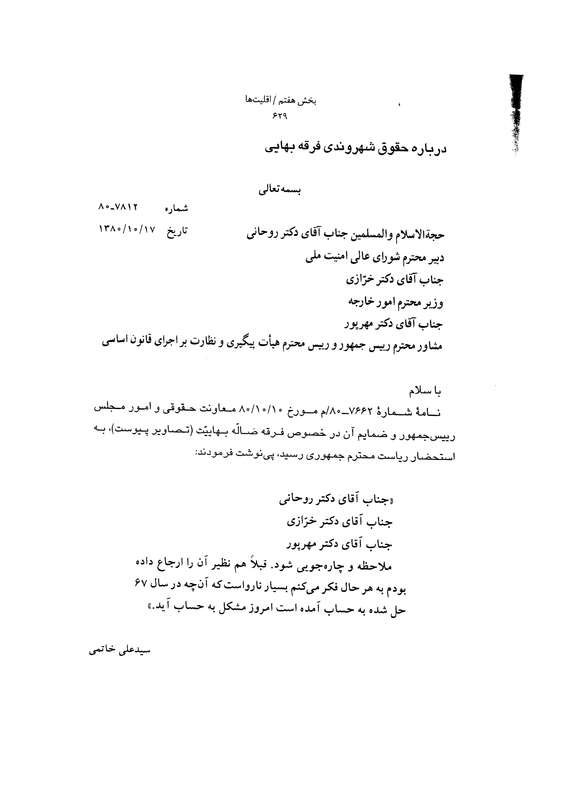 According to the report presented at the official meeting of the commission of Articles 88 and 90 of the Constitution held in the parliament on 80/10/9 (30/12/2001), in which I was present, it was noted that a number of government employees are being deprived of their civil rights on the basis of their belief and connection to the Baha’i sect. By providing background information on the subject and with due regard to the Article 23 of the constitution of the Islamic Republic of Iran, your considered interpretation as the President and the authorized official responsible for the implementation of the Constitution, in so far as it applies to the requirement of preservation of the civil rights of the membership of the Bahá’i sect, is conclusive.